New technology is being rapidly adopted in Brazil – and the banks are no exception. In São Paulo’s classy JK Iguatemi Mall, Bradesco’s has installed a showcase for state-of-the-art banking technology. Albeit that some applications are designed very much for the growing Brazil consumer population, and of course presented in Portuguese. 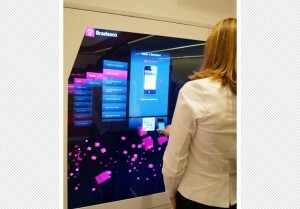 In a significant step that heralds a major new look in consumer banking in Brazil as Bradesco’s Olympics activation unfolds, the bank has installed biometric ATMs, robotic greeters, smart walls and Star Trek – read iPad -style touchscreens. 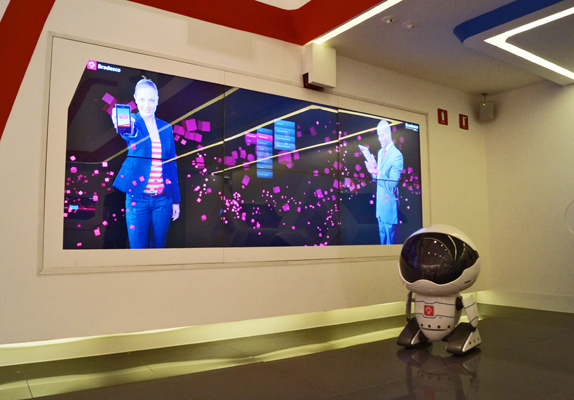 At Bradesco Next, a robot greeter senses when traffic is high or low and acts accordingly. ATMs inside the two-story space have biometric logins where users can access their account via hand recognition. In special rooms, customers can opt to speak with a digital consultant or a real bank person. The glass walls automatically frost to ensure privacy. Bradesco has pursued biometric technologies enabling the creation of an innovative, smart bank that recognises patrons and customises the ebanking experience to their needs. This is way ahead of most banks elsewhere. And it will be interesting to see how Bradesco’s main rival, Itau, sponsor of the 2014 World Cup, might respond.